Looking forward to having a good dance after having such a stressfull week. SHOULD BE A GOOD ONE, TRUE SOULIES AND FRIENDS OF EAST KIRKBY,STILL ON A HIGH FROM SKEGGY AND WANTING SOME MORE....LETS GO FOR IT!!!. DAVE AND MYSELF SHOULD HAVE RECOVERED BY FRIDAY SO WE CAN START ALL OVER AGAIN. Done most of the East Mids clubs but not this one till now! 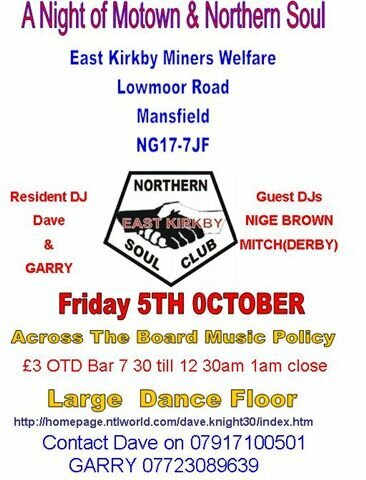 HIYA NIGE, ALWAYS GLAD TO SEE SOME NEW FACES, COME AND SAY HELLO AND IF YOU'VE GOT A FAVE RAVE LET US KNOW AND WE WILL TRY AND PLAY IT FOR YOU. CHECK OUT THE FLYER FOR TIMES AND DIRECTIONS AND OH YES CHEAP PINT TO GO WITH THE GREAT TUNES. I THINK ITS YOU WHO NEEDS TO CHECK OUT THE FLYER GAZ! I MAY HAVE A FEW TUNES IN ME PLAY BOX!! THIS IS WHY I HAVE HAD ALL MY RECORD LABELS REPRINTED IN BRAILLE! any chance of some directions too the club from Jtn 28 M1! ive put lowmoor road in me sat nav and it doesnt recognise it!! Thats a start anyway your a goodn mate!! CARRY ON INTO KIRKBY DOWN THE HILL, THROUGH THE FIRST SET OF LIGHTS AND INTO THE FILTER AT THE NEXT LIGHTS TO TURN RIGHT. TAKE A RIGHT AT THESE LIGHTS AND FOLLOW THE ROAD ROUND, TWIST RIGHT AND THEN LEFT, THEN THROUGH THE NEXT SET OF LIGHTS, PASSING A TESCO PETROL STATION ON THE RIGHT, THEN A PUB AND THEN REACHING A MINI ROUND ABOUT. TAKE A RIGHT AT THIS MINI ROUND ABOUT AND THE WELFARE IS ABOUT 50 YARDS ON YOUR RIGHT. IT SHOULD TAKE ABOUT 10-20 MINS FROM THE M1 WITH THE TRAFFIC AND LIGHTS IN YOUR FAVOUR. Cheers for all the help guys!! Me Sat nav has now accepted the steet BEFORE Lowmoor Road (Ellis Street) so i should be ok. I can drive to "ANNERSLY blindfolded with headphones on" so i should able to find your club!! I THINK YOUR SAT NAV MIGHT BE BETTER THAN GAZ NAV!